Sole Belle Meunière means "sole prepared in the manner of a pretty miller's wife." It turns out I live 15 minutes from a working 19th century flour mill said to be haunted by a miller's wife named Ann Crosby. So I hopped in the car and visited this heritage site that still sells freshly-milled flour and daily bread—you can't get much more local than that! 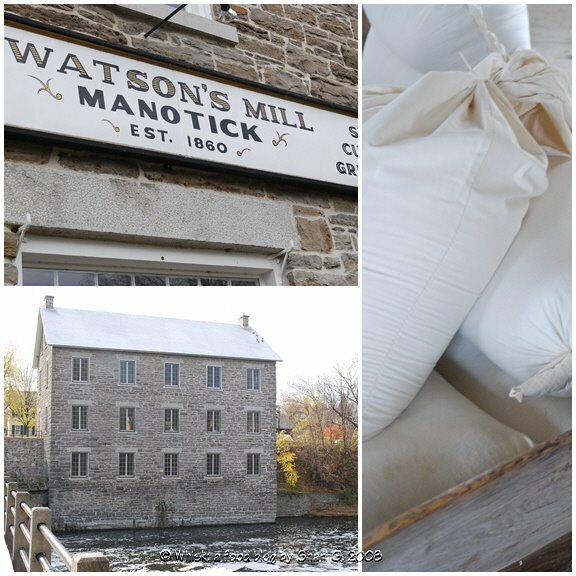 Watson's Mill in Manotick, Ontario, is a functioning gristmill that produces tons of stone-ground wheat flour every year. 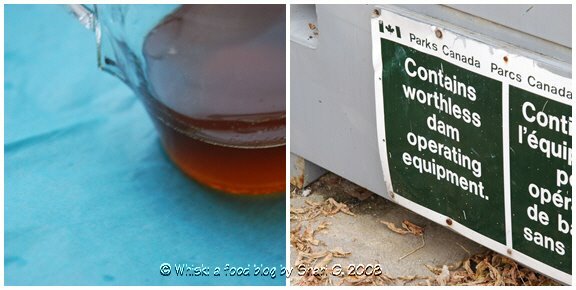 I was able to purchase whole wheat flour milled only two days before and enjoy a photo walk as well. stepped back, and said: "Bon appètit!" I closed my eyes and inhaled the rising perfume. Then I lifted a forkful of fish to my mouth, took a bite, and chewed slowly. The flesh of the sole was delicate, with a light but distinct taste of the ocean that blended marvelously with the browned butter. I chewed slowly and swallowed. It was a morsel of perfection. After sprinkling the fish with some salt and pepper, I dredged it in flour. The flour keeps the meat from sticking to the pan, protects the tender meat inside from the oil, and allows it to get brown. In a separate pan, I cooked the mushrooms in a bit of butter and oil until all the moisture had evaporated. A sprinkle of salt and pepper, and they were ready to plate. Unlike last week with a vat of oil, pan frying uses a lot less oil and some butter for flavor, and is also considered a dry heat cooking method. Using a frying pan, I browned the fish on both sides, keeping the pan hot enough so that it wouldn't stick. The key to this recipe is the beurre noisette. Beurre noisette is just butter that's been browned and literally means "hazelnut butter". Simple, effective, delicious. Once again, Manotick, Ontario played a part in this post, specifically the Black Dog Bistro. A couple weeks ago, we went there for dinner, and with the bread came this unusual spread. I couldn't put my finger on the taste, but I knew I had tasted it that afternoon. Earlier in the day, I was caramelizing sugar and hardening it for my Crème Brûlée photo. And this spread had the same overtones. It turned out to be caramelized butter, or beurre noisette. It had been melted and refrigerated, then served at room temperature. It had the consistency of mayonnaise, but it was sweet. We gobbled it up, and it's become a restaurant destination we plan to visit more often. To add a touch of elegance to the plate, the book says to score the lemon decoratively and then slice them thinly. So, I scored them and sliced them and chopped up the parsley. Here's a great video showing how to make Sole Meunière. Also, Manggy from No Special Effects has a wonderful post about Sole Meunière. I halved the recipe so what's shown will serve 3. You can find the recipe for Sole Belle Meunière (Pan-fried Sole with Nut-brown butter and Mushrooms) in the book Le Cordon Bleu at Home. To see how the rest of the Whisk Wednesdays group fared with their recipe, click here (or check out the sidebar) and then click on each blogger! 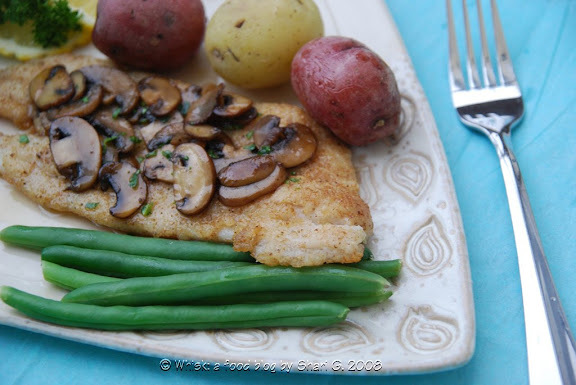 The nuttiness of the butter drizzled over the crispy pan-fried sole was delicious! And it's so easy to make. I served the sole with baby new potatoes and green beans, which also tasted wonderful with the beurre noisette. I think everyone should make this dish at least once in their lives. Looks wonderful! I love Julia's description. Can taste this wonderful dish as I read. Haven't made it for so long time to remedy that I think. Thanks for reminding me. I bought fillets too - cod because it was on sale. I loved the dish, especially the butter. Hubby has been to that same mill and also has a picture of the dam sign! I love all the bits of info that you throw in! Is that Dotti Potts pottery? !Beautiful plating! It looks like the perfect meal. I love your post! What a fabulous story of your area...the ghost, the mill...your dish! Your plating is lovely too. I confess it took me a minute to think to click on the links. Duh! Excellent as always Shari! I’ll better check the archived posts from your site. Ciao! That sounds absolutely wonderful, and your pictures are lovely. They are just so atmospheric, I could almost feel the crisp autumn air. emiline - I'm glad I've made it now (and found a place to get local flour)! jacqui - It's so easy. natashya - That sign is too funny! anonymous - Yup, it's Dotti Potts. I love her pottery. cantbelieveweate - I'm lucky to live so close to the mill. bob lagatta - I'll have to check your blog out too. irene - It was a crisp, autumn day earlier this week. Cold today! eb - I'm "grieving" the end of summer! This is one good looking dish. 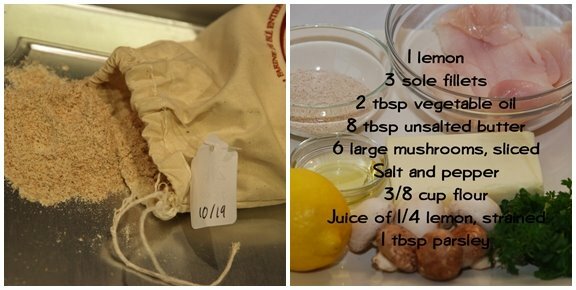 I loved the recipe - sounds delicious and easy to make too! This sole looks delicious. I can almost sell it cooking now. My wife loves almost all fish, but I myself am not. This receipe looks like it will satisfy both of us!